← Kalamazoo, Michigan. August 7th, 2011. Portland, Oregon. August 8th, 2011. A sinkhole appeared this morning in Southeast Portland, near the intersection of Southeast 37th Avenue and Clay Street. Chris Nowak, 24, of Portland, and his fiancee, Jessie Hargrove, 22, of Redmond, noticed the small hole as they parked near the back stage entrance of the Baghdad Theater shortly before 11 a.m.
Nowak said the 18-inch by 18-inch hole, which he covered with a white plastic lawn chair, appeared as a large truck passed. 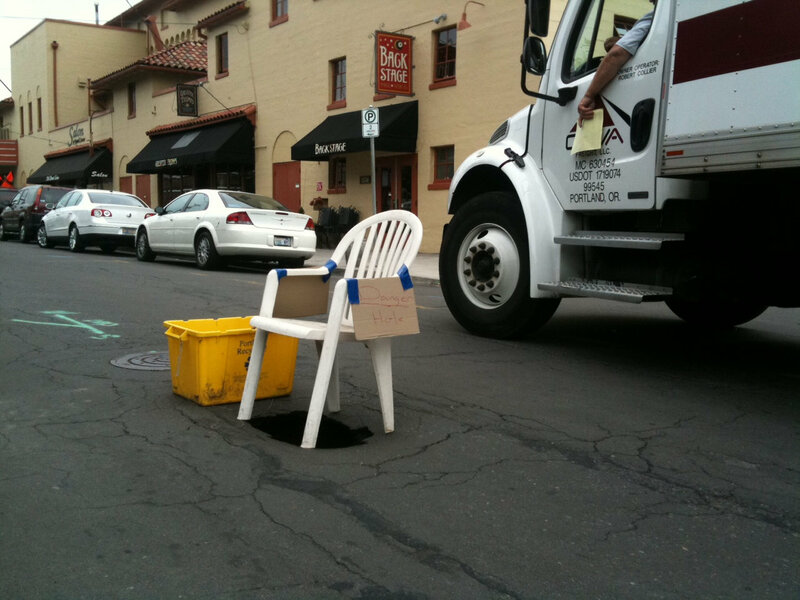 The Portland Water Bureau’ dispatcher Chris Saludares alerted the city’s Bureau of Transportation about the hole. This entry was posted in Pictures and tagged Oregon, Portland, sinkhole. Bookmark the permalink.